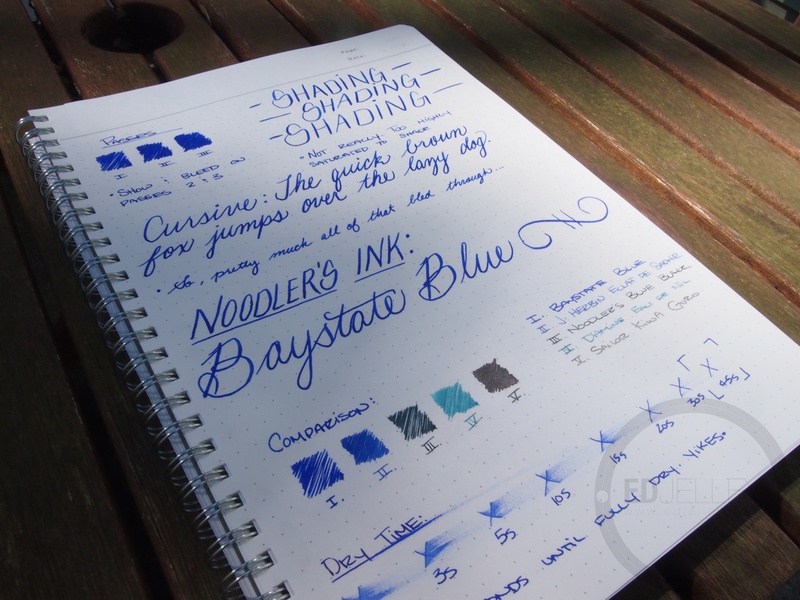 Well…the infamous Noodler’s Baystate Blue…here it is. 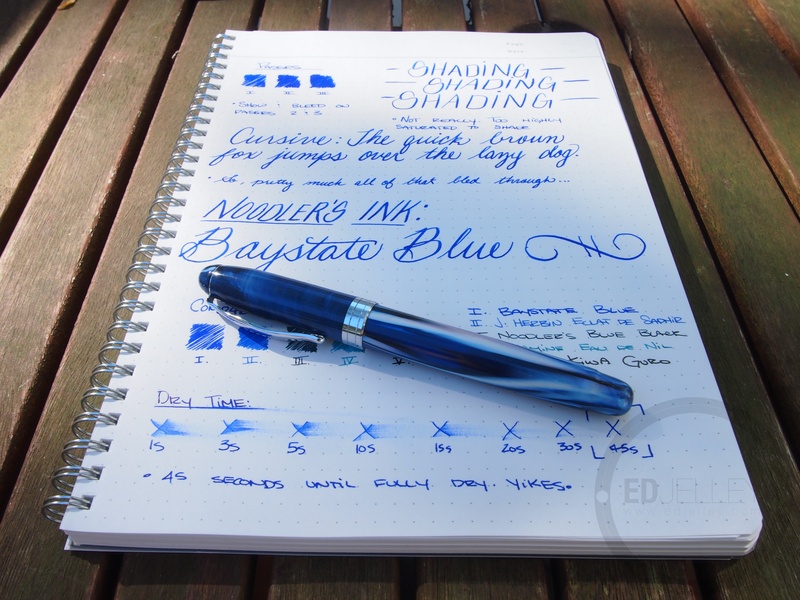 Noodler’s Baystate Blue has obtained a spot as one of the worst-behaving, pen-destroying inks out there. 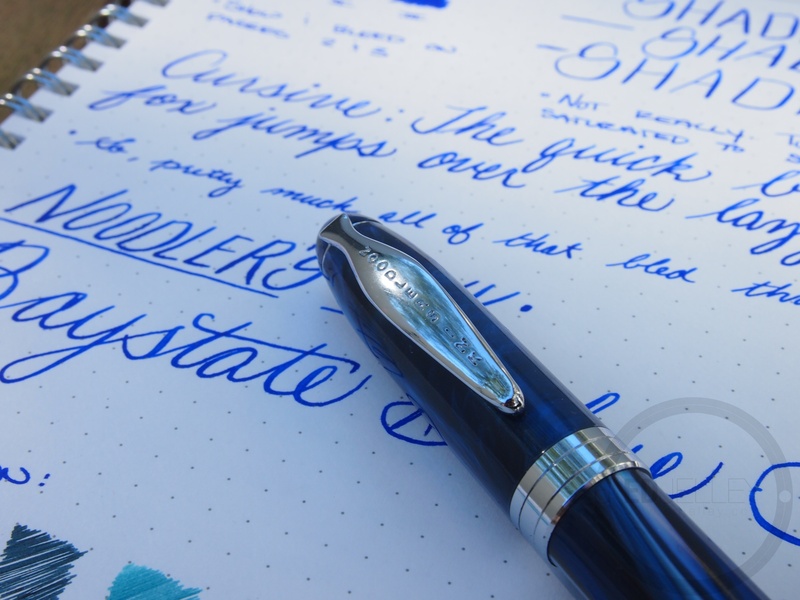 It eats vintage ink sacs, melts Pilot feeds, and turns any demonstrator you have into a blue pen. With that being said, it’s one of the most vibrant, saturated, and bright inks I have ever used. With all of the problems commonly associated with the ink, I decided to fill up my unruly Noodler’s Ahab. For some reason, two negatives make a positive here. 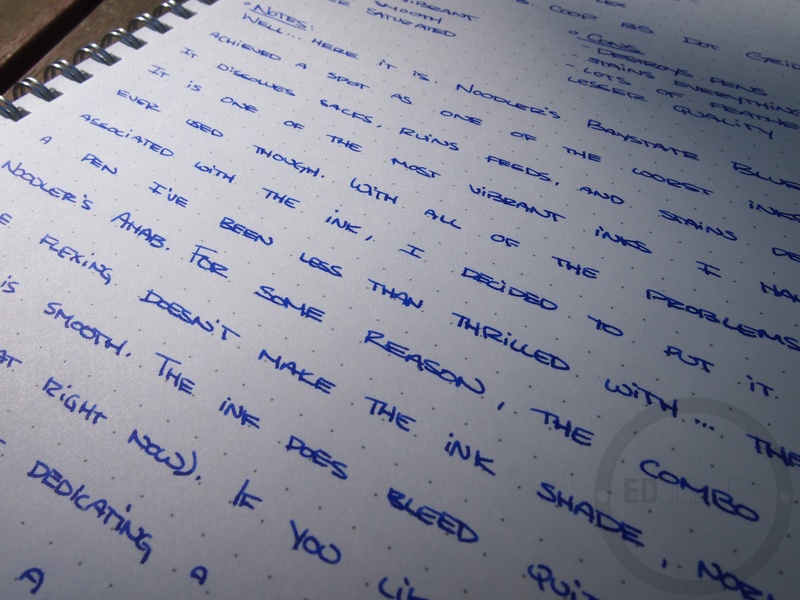 The ink writes smoothly, and flows nicely in the Ahab. 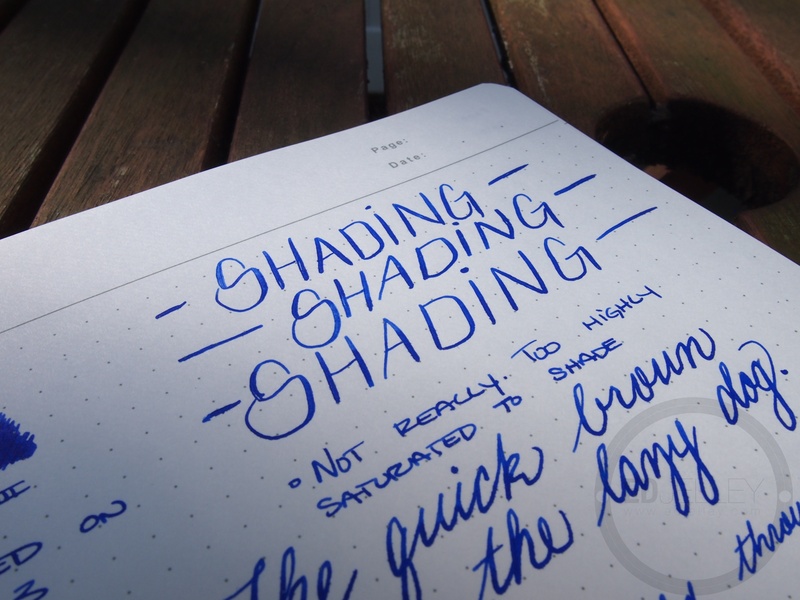 Adding some flex to the written line doesn’t make the ink shade, I suspect due to it’s high level of saturation. Writing normally is smooth and consistent though. The ink does manage to bleed through just about every paper I use it on, so every day practicality is at a minimum. If you like the color (which many do, myself included) I would suggest dedicating a cheap pen to the ink. On the positive side, it’s super vibrant, and smooth. On the negative side it feathers, bleeds, and eats pens. Proceed at your own risk when trying this ink!!! Also, huge thanks to Peter for sending me the bottle! That bottle can go around the world, as long as it never comes back to me! Sure. Please give your bottle to me, if you have one. I only use BSB. And please don’t cheap out on papers. Its a good thing we understand the importance of good stationary in our office. Its an amazing blue! Unlike any other. I have caged this beast in my pilot metro in a cartridge. And a dedicated syringe for BSB and BSConcordGrape for refilling. I use it to update my monthly calendar which I’ve printed on HP Premium 32-lb paper, so feathering and bleedthrough are minimal. I wanted to try it out for myself to see what all the fuss was about. And maybe I’ve lucked out. Pingback: Just another pen ? !Blick über den Tellerrand vom 5. October 2013 » Just another pen ?! 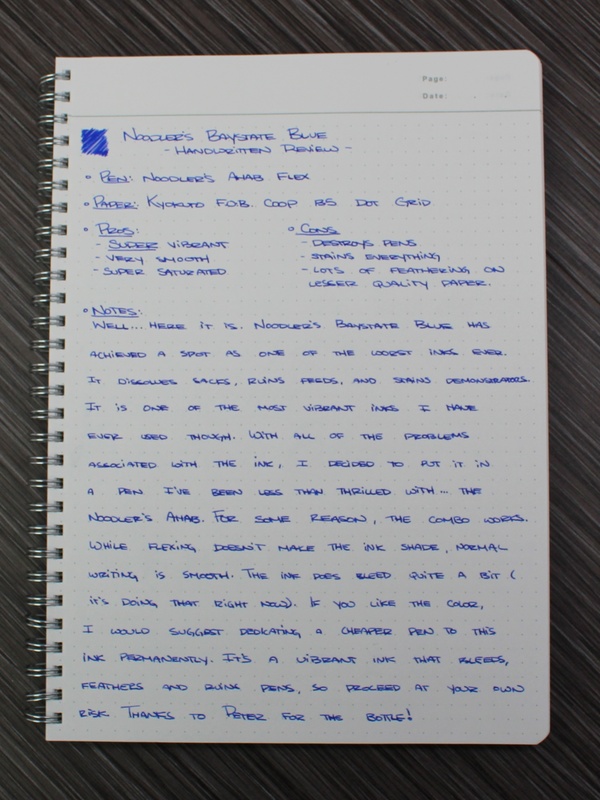 I bought a bottle of this on a whim…put it in a eye-dropper converted platinum preppy…the combination of Doane Paper, this ink/pen, and my left-handed writing has become one of my favorites. Here’s what I think…BSB does not want to be shown up by your fancy highfalutin pen…it demands to be used only in crappy plastic pens, so as not to take away from its majesty…it’s just good science. Two negatives make a positive. 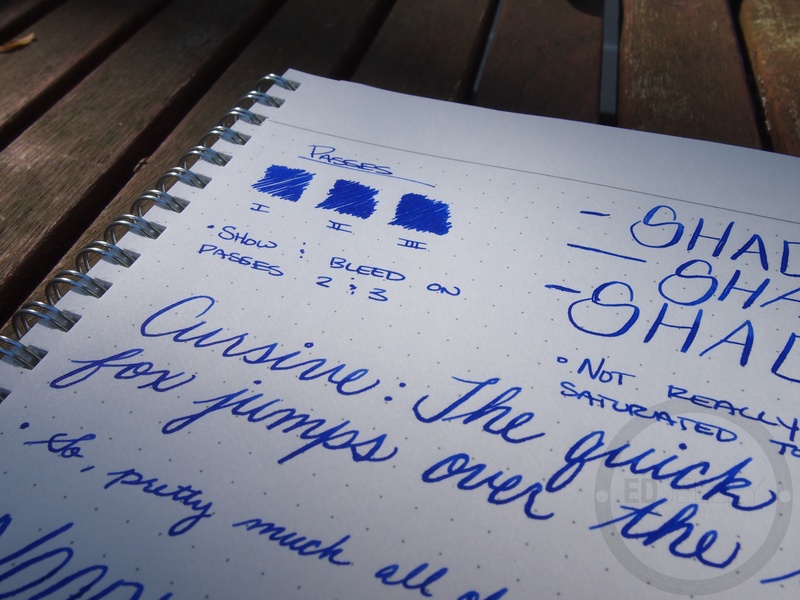 It’s definitely a great looking ink that demands a crappy pen. Just keep that your Preppy doesn’t crack and permanently stain everything in a five foot radius bright blue. Only seems to eat pens if you betray it and switch to another ink (or came from another ink), as it seems that any of it managing to mix with a non-baystate ink is where the problems occur. (hence why pens dedicated to it from the get-go seem to never suffer any problems). I have BSB in a Platinum Plaisir with the 03 nib that I converted to an eyedropper pen, and it is now one of my favorite pens. 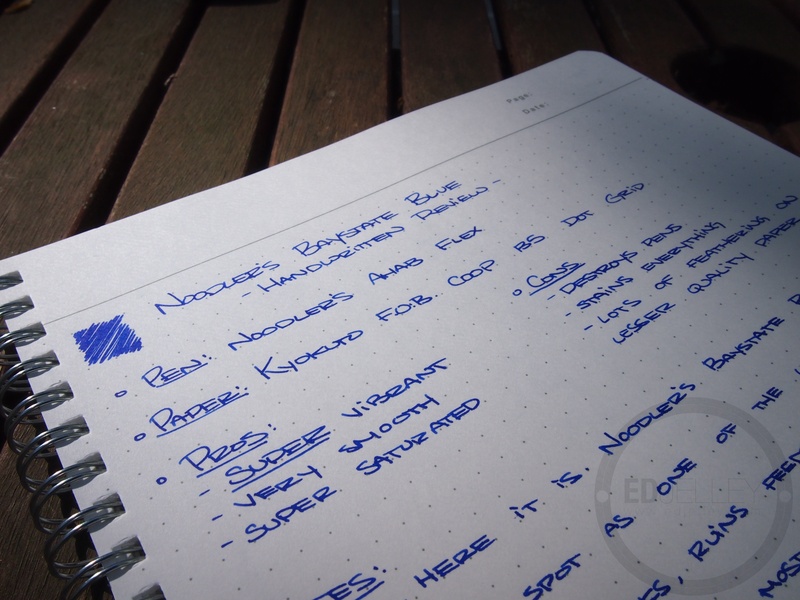 Putting BSB in pen with a fine or extra fine nib does cut down on bleed thru (without eliminating it though). The heavier the paper, the better. Definitely. Bay State Blue has two misbehaviors which make me unwilling to use it: first, the tantrums it throws when you ask it to play nice with other insk; second, it’s a vampire, and cannot withstand sunlight. Very few, if any, fountain pen inks fade faster. 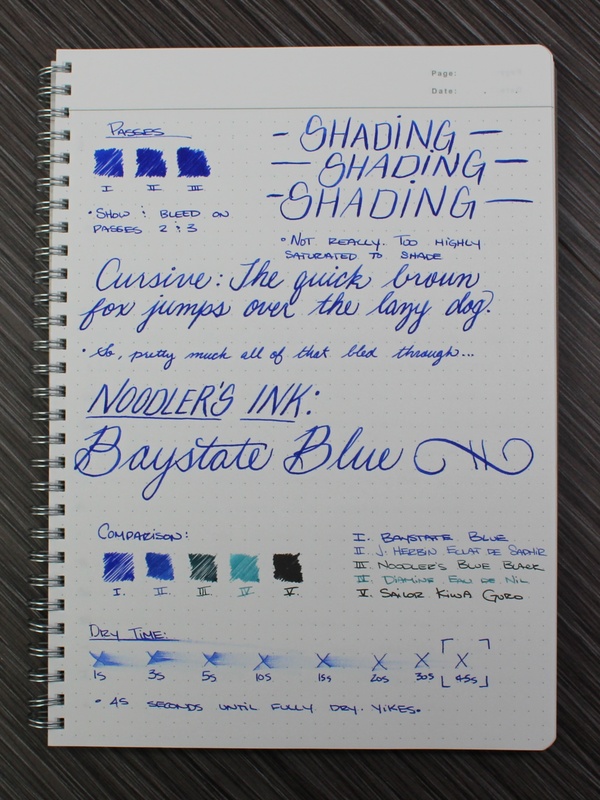 I absolutely adore the color of BSB, but after it destroyed three of my best pens, I had to let it go.